Though the McVitie & Price factory burned down in 1894, it was rebuilt the same year and remained operative until 1969, when production ceased and operations were transferred to English sites. McVitie & Price expanded to a new factory in Harlesden in 1910 and to Manchester in 1917. The firm acquired Edinburgh bakery Simon Henderson & Sons in 1922. McVitie & Price merged with another Scottish family bakery, Macfarlane, Lang & Co., Ltd, in 1948 to become United Biscuits Group. McVitie’s brand products are now manufactured in five United Kingdom factories: the two former McVitie & Price factories in Harlesden and Manchester, a former Macfarlane, Lang & Co. factory named Victoria Biscuit Works in Glasgow, a former Carr’s factory named The Biscuit Works established 1831 inCarlisle, and the McVitie’s Cake Co. factory (formerly Riley’s Toffee Works) in Halifax. 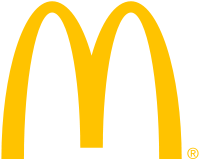 McDonald’s Corporation (NYSE: MCD) is the world’s largest chain of hamburger fast food restaurants, serving around 68 million customers daily in 119 countries. Headquartered in the United States, the company began in 1940 as a barbecue restaurant operated by the eponymous Richard and Maurice McDonald; in 1948 they reorganized their business as a hamburger stand using production line principles. Businessman Ray Kroc joined the company as a franchise agent in 1955. He subsequently purchased the chain from the McDonald brothers and oversaw its worldwide growth. A McDonald’s restaurant is operated by either a franchisee, an affiliate, or the corporation itself. The corporation’s revenues come from the rent, royalties and fees paid by the franchisees, as well as sales in company-operated restaurants. McDonald’s revenues grew 27 percent over the three years ending in 2007 to $22.8 billion, and 9 percent growth in operating income to $3.9 billion. Cadbury Buttons are flat, circular, button-shaped chocolate pieces sold in small packs in Australia, Canada, Ireland and the United Kingdom by Cadbury. They are available in Cadbury’s Dairy Milk and white chocolate. Action Man is an action figure boys’ toy launched in Britain in 1966 by Palitoy as a licensed copy of Hasbro’s American “moveable fighting man”: G.I. Joe. 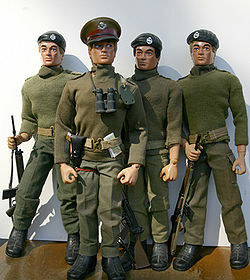 Action Man was originally produced and sold in the United Kingdom and Australia by Palitoy Ltd of Coalville, Leicestershire from 1966 until 1984 (Palitoy also offered sub-licenses to various toy manufacturers in various markets). The figure and accessories were originally based on the Hasbro (US) 1964 G.I. Joe figure (for 1966–1969 production). Hasbro’s G.I. Joe figure was patented in 1966 Even the specific method of attaching the appendages was patented as a “Connection For Use In Toy Figures”  The first Action Man figures were Action Soldier, Action Sailor and Action Pilot. All were available in the four original hair colours: Blonde, Auburn, Brown and Black. They were accompanied by outfits depicting United States Forces of WWII and the Korean War. In later years, the figures and accompanying uniforms and accessories would more accurately reflect the forces of the United Kingdom. 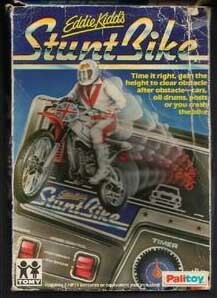 Action Man was subsequently reintroduced in 1993, based on the G.I. Joe Hall of Fame figure of that time.